Hi - We spent last night at the Marriott Courtyard in St. George. They had a special for their Hotel (a little bit off the normal price) and we decided a break was in order. A big bed and a tub!!! I had a couple of glasses of "Big House Red" while in the tub - later we met Jim and Barb at "Scaldoni's"; an Italian Cafe. Very good; a nice change of pace. In fact, we've decided that about once a month we should take this vacation again. Had our weekly happy hour tonight. 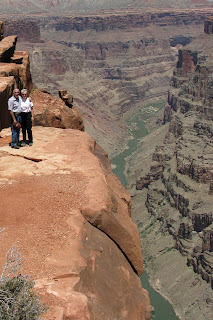 A new guest - 24 year old girl that has hiked the canyon rim-to-rim in 9 hours!! Very interesting person - hope she visits us again. Good to have a younger point of view during our heated conversations. Work here at the North Rim is going well; I am looking forward to our return to the Valley of the Sun (even though it's pretty hot there, now). I've ordered a new computer, so my other two laptops will be for sale. One is a 15" HP with XP, extra memory, and a high capacity battery. A very nice machine that includes a case. The other is a larger laptop. It's an Acer Aspire 5100 with extra memory, Vista, and a case. Both have been very good laptops, but it's time for me to try a notepad - and HP just came out with a new one. Still hoping other highspeed options will be available internet access in the Valley. It looks like that Wimax is a distinct possibility. Very exciting. Last night was the full moon. Rather than going straight home after work, we decided to take a few pictures (and drink a cold beer). It was very nice on the Veranda. Last night we had two male employees in the store from Xanterra on the South Rim. One spent a long time trying on a girl's t-shirt. He changed clothes in the Native American room. Once he and his friend decided upon the shirt size, he give me the clothes he had tried on and picked a shirt from the folded pile because the shirts he had tried were now "old"!! Weird, gutsy, rude. We made it! Beautiful views - a long way down. The dirt road became progressively bumpier (they called it "primitive" near the end), but Jim's truck had no problems with clearance or power. This spot would be a great overnight camping experience. I'll bet the stars are awesome. I've uploaded some pictures to the Picasa site and am trying to upload a short video, too. 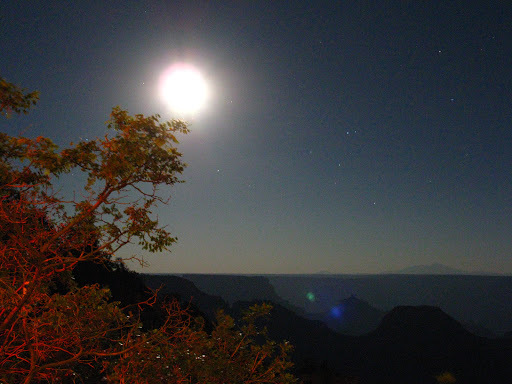 I'm currently working at the North Rim of the Grand Canyon; will return to the Valley in mid-October. We might be able to get a ride to Toroweap next weekend. That's my goal for the summer. Do a Google search to see what it looks like! I hope we have pictures next week. I've added some Gift Shop photos to SmugMug and Picasa - take a look. It's been a good weekend. We just finished our Saturday night happy hour and are looking forward to our "Monday" morning tomorrow.